Dalat is one of the most famous destinations in Vietnam—and for good reason. From its gorgeous waterfalls, traditional silk factories, and buzzing night market, to its small batch coffee farms, Dalat makes for an ideal getaway from the major cities. In order to make your great escape a bit easier, Vietcetera popped over to the “City of Eternal Spring.” There, we traced an engaging weekend itinerary to put together this insider’s guide to some of its most popular sites and refreshing experiences in the capital of Lam Dong Province. If you’re interested in making a weekend escape from Ho Chi Minh City you can depart very late on Friday evening in order to maximize your time there. Regardless of your budget, a weekend of entertaining activities and incredible food is guaranteed when you travel to Dalat. In our experience, there is no need to hire a tour guide when you travel to Dalat. It’s not oversaturated with activity options, and all the information needed to independently navigate this relatively small destination is easily accessible. We spent two full days there in total, dedicating Saturday to the discovery of two waterfalls and a silk factory in the southern region. Then on Sunday, we moved north for a hike to renowned Lang Biang Mountain and a visit to an organic coffee plantation before popping over to The Crazy House prior to our departure back to HCMC. The most affordable way to travel to Dalat from Ho Chi Minh City is by bus which takes about 5 to 6 hours. We advise taking the late sleeper bus on Friday night in order to maintain your normal sleep cycle. For this reason, we decided to depart at 1:00 am. 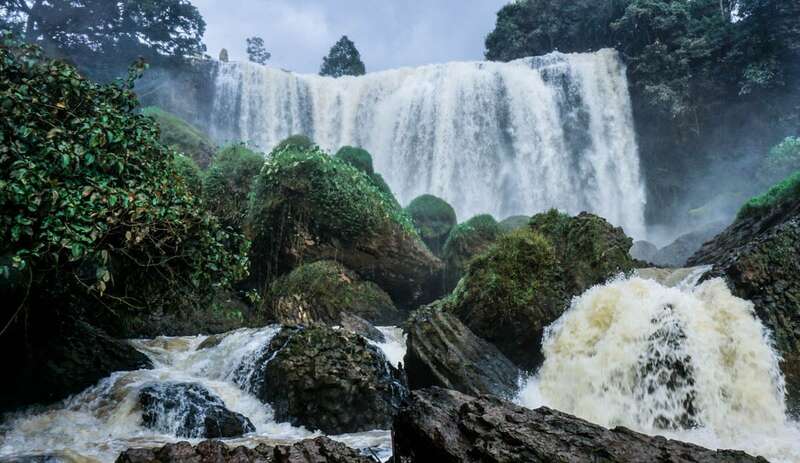 Leaving at this time also allows you to arrive in Dalat early Saturday morning, giving you a full day of exploration. 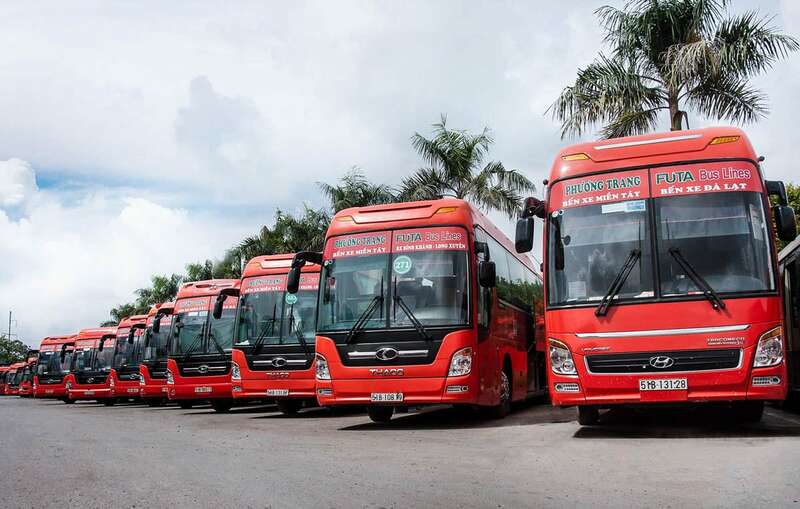 The most reliable and widely trusted company is Futabus (or “Phuong Trang” in Vietnamese). You can buy tickets online or at their office located on De Tham, in HCMC’s backpacker area. Travel to Dalat by air means landing at Lien Khuong International Airport, around 30 km outside Dalat city center. Taxis into town are available at the stand outside the airport for around 400,000 – 500,000 VND. Although currently Southern Vietnam’s second largest airport, you will still be expected to cross the tarmac on foot into the airport terminal. Currently, there are three airlines running daily flights between Ho Chi Minh City or Hanoi and Dalat, and other cities in Vietnam including Hue, Hai Phong, Vinh, and Danang. Each airline has varied prices and departure times running to and from each destination. International flights also link Bangkok with this Central Highlands destination. Please click on the links provided to see which airline is best suited to your travel itinerary and personal budget. And take note that direct flights from Ho Chi Minh City take less than one hour. 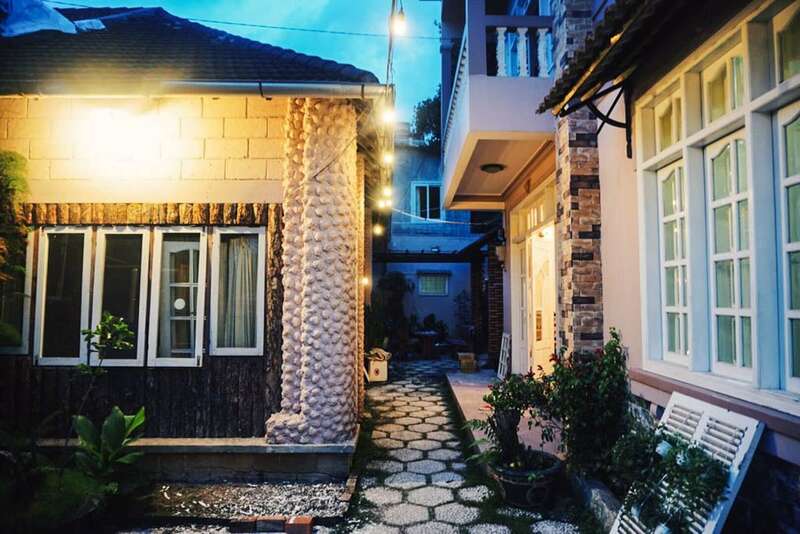 If you’re not sure where to stay when you travel to Dalat, check out at the Classic Garden Homestay. They maintain solid reviews across the board with a 9.2 out of 10 on booking.com from 16 guest reviews. The rooms were clean and tidy with well trained and attentive staff. The location is central, quiet, and within walking distance to the bustling night market. You’ll find it 650 meters from Dalat’s city center. If you’re a nature lover with plans to travel to Dalat, look no further than the Swiss Belresort Tuyen Lam. 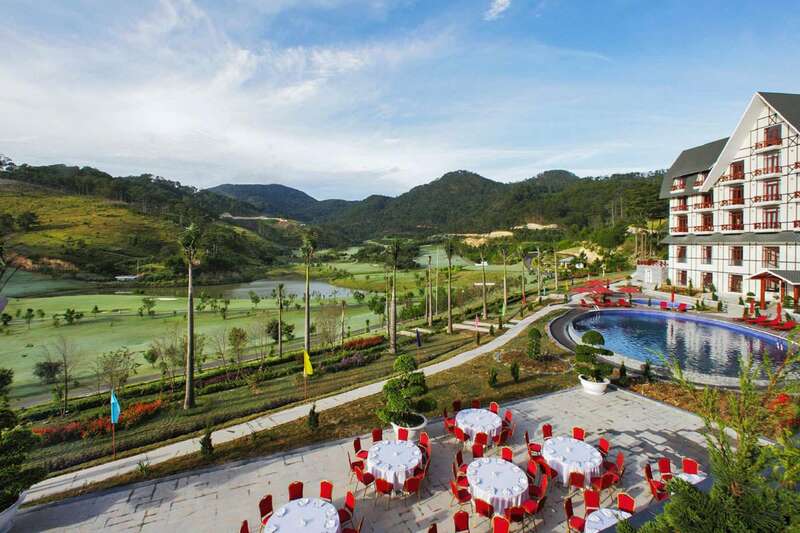 Overlooking a scenic golf course, with picturesque mountain backdrops, and on-site botanical gardens, this Anglo-Normand style structure makes for the perfect environment to take in the exquisite natural beauty of Vietnam’s Central Highlands. Over 265 guests have helped the hotel to a stellar 8.4 out of 10 rating on booking.com. While the Swiss Belresort is an idyllic destination for those keen on having plenty of room to roam, its location is quite far from Dalat’s center, resting 17 kilometers from the attractions in the middle of town. But the hotel does feature indoor and outdoor swimming pools, a tennis court, fitness center, and a playground for the kids. Dalat’s luxurious 5-star Anamandara Resort is widely hailed as one of the best high-end villas in the entire city. Their seven standout colonial villas in the rural highlands make for a quiet retreat into Dalat’s countryside, helping them to an 8.6 out of 10 rating on booking.com, from 281 guests reviews. 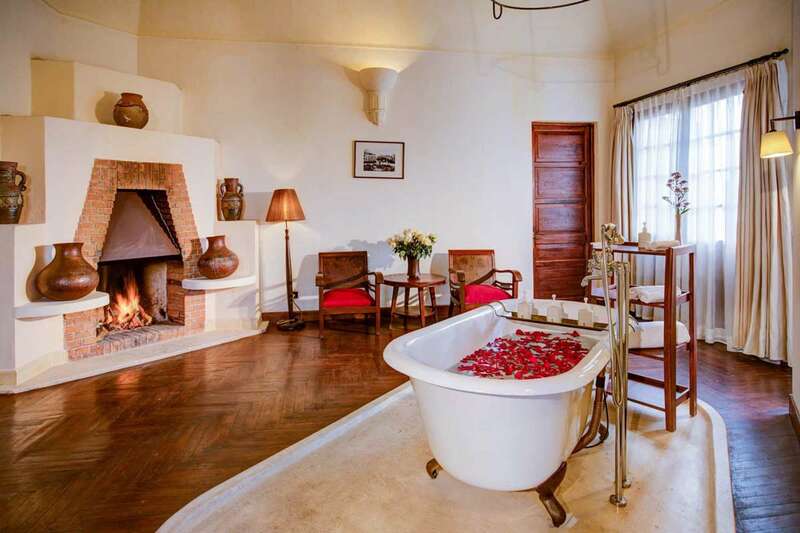 It’s located 1.5 kilometers from the city center, and with a range of opulent spa treatments, impressive dining options, cozy in-room fireplaces, cooking classes, and tour packages, the Anamandara Resort stands out as a prime accommodation option in the region. Renting a motorcycle when you travel to Dalat is perhaps the best way to explore the region giving you complete freedom to scout the town and its surrounding areas at your own pace on roads that are reliably less clogged than Vietnam’s major cities. There are numerous places to rent a motorbike in Dalat’s central area, but the most convenient option is to find accommodation that offers rental on-site. 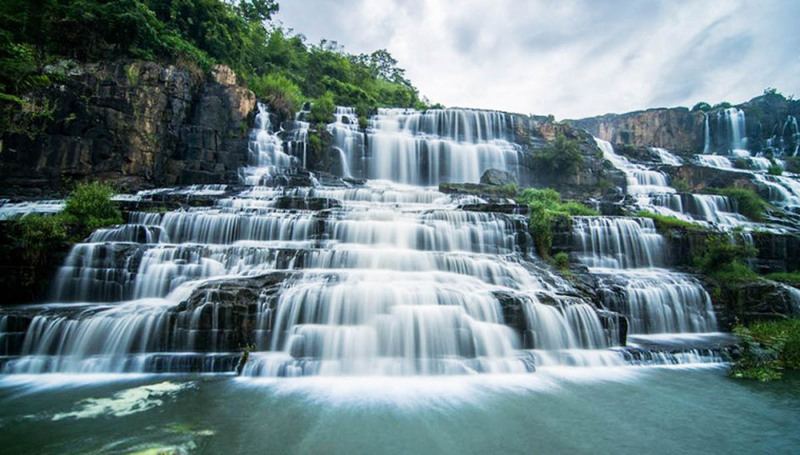 Many claim that Pongour Falls is one of the most beautiful waterfalls in all of Vietnam making it a site that attracts foreigners and locals alike. If you are traveling from the center of town, it will take about 60-90 minutes (50 kilometers) by motorbike to reach the falls. Once you arrive, an additional 10-minute walk is required along one of two small footpaths. You can opt for an easy dirt path or a more breathless hike up the stairs. 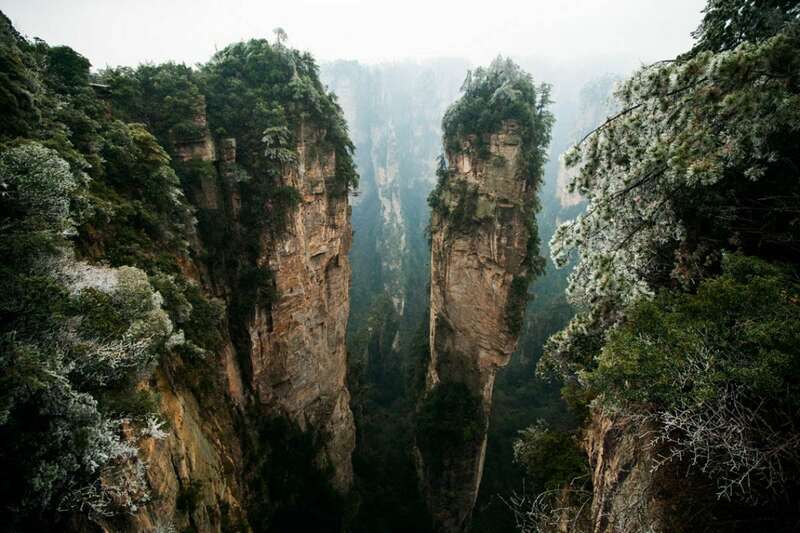 Pongour Falls is 40-meters high and 100-meters wide. Several streams of water cascade down its gorgeous seven-stair natural terrace. The landscape surrounding the falls is also worth mentioning as its dense, untouched forest provides for stunning views. 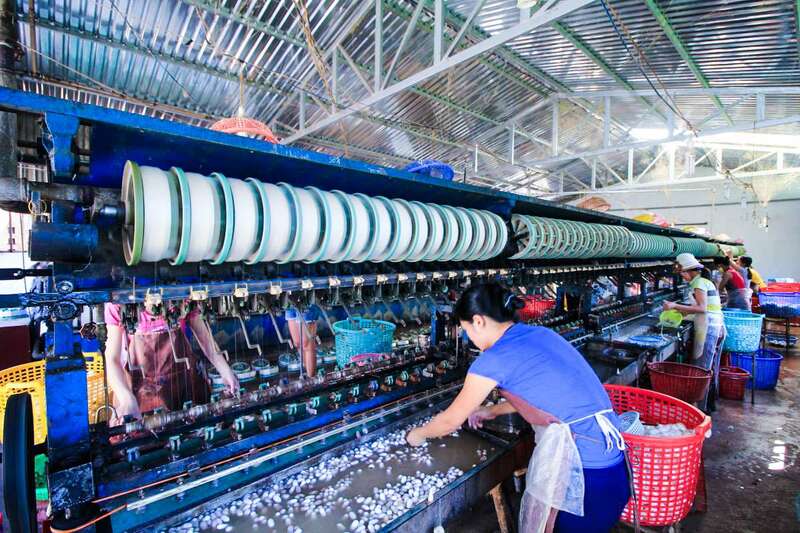 From Pongour Falls, it takes about 50 minutes to reach the Cuong Hoan Silk Factory. We suggest eating before you go because there are few restaurant options on the stretch between Pongour Falls and the silk factory. However, once you get closer to the factory a number of more interesting places to eat can be found. Once at the factory, your experience there will be pretty straightforward. During our stop, we did not find anyone that spoke English, which required some independent navigation of the factory. As you make your way through, you can catch glimpses of the production line. The entire process includes reeling, weaving, bleaching, dyeing, sewing, and finally embroidery. A full self-guided tour will take no more than 30 minutes and is best paired with a visit to Elephant Falls. Do note, the indicated path between the Pongour Waterfall and the silk factory can be very muddy and sometimes inaccessible. From the entry point, guests will be required to take a short 5-10 minute walk. Be aware that the footpath is not the best and if weather conditions are rainy it can become quite slippery although handrails are in place at some points along the way. The first few meters are paved leading to an uneven stone path along the side of the falls. Elephant Waterfall is 30 meters tall and so you’ll know you are in proximity to it once you hear the thunderous sounds of the crashing water. Standing next to the falls is a wonderful experience as you are able to witness the incredible strength of the water’s flow whilst enjoying the refreshing mist it produces. 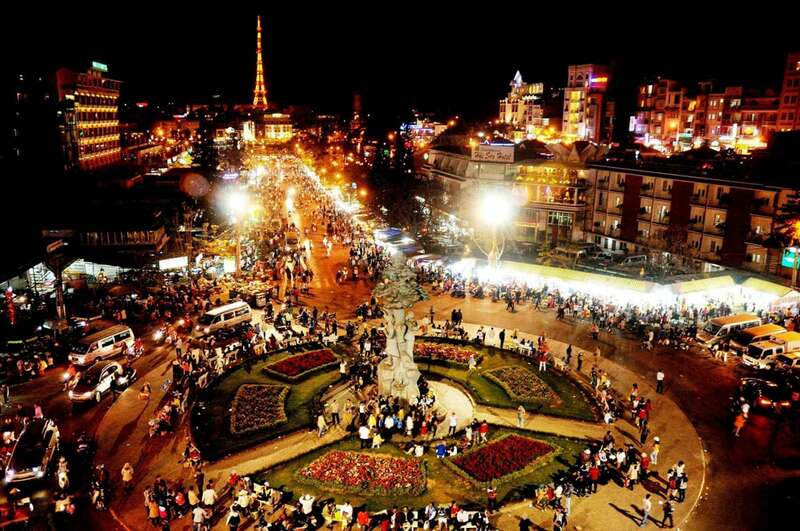 The night market is the only official pedestrian area in the city and is a must-see if you travel to Dalat. The night market consists of a wet market, a food market, an area for new and used clothing, and some fascinating street performances. Regardless of what you’re after, Dalat’s night market makes for a fantastic local experience. Perhaps the most popular item sold is the “Dalat Pizza”. Circular rice paper serves as the “crust” for this local cuisine before egg, spring onion, shrimp, pork or beef, chilli, and sometimes a small portion of cheese are added and grilled on a small brazier that also helps to keep their cooks warm on cold Dalat evenings. Continuing on our exclusive weekend travel itinerary, Sunday makes for the perfect time to visit Lang Biang Mountain for a hike before the bus ride back to HCMC. At Lang Biang there are two options, each leading to two different peaks. You can load into a 4×4 Jeep that will drive you 15 minutes directly to the top of peak one. This route will take you to a lookout point featuring an old American army radar base and landing pad at 1,929 meters high. Option two is to make the hike on foot to the summit. This point sits at 2,167 meters, marking it as the highest point in the area. For us, the hike took 4 hours but the breathtaking views overlooking the lush valley below was well worth the effort. Once you’re on the main path, walk about 15-30 minutes and you’ll see two wooden huts on your right. This marks the beginning of the next part of your hike. After a few minutes of trekking you’ll access some overgrown steps to continue your rigorous ascent through dense foliage up to the peak. If you go for option two make sure to bring at least 1.5 liters of water. The trails are overgrown and the terrain is rough in areas. Without enough water, the hike could become uncomfortable. If you arrive before nightfall, you can visit the Crazy House. 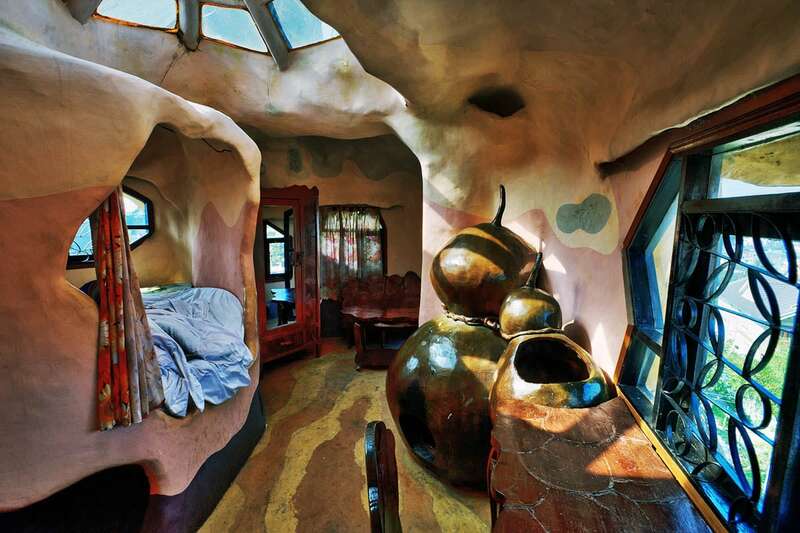 This wacky, Salvador Dali-esque hotel is rightfully on many lists as one of the craziest hotels in the world. 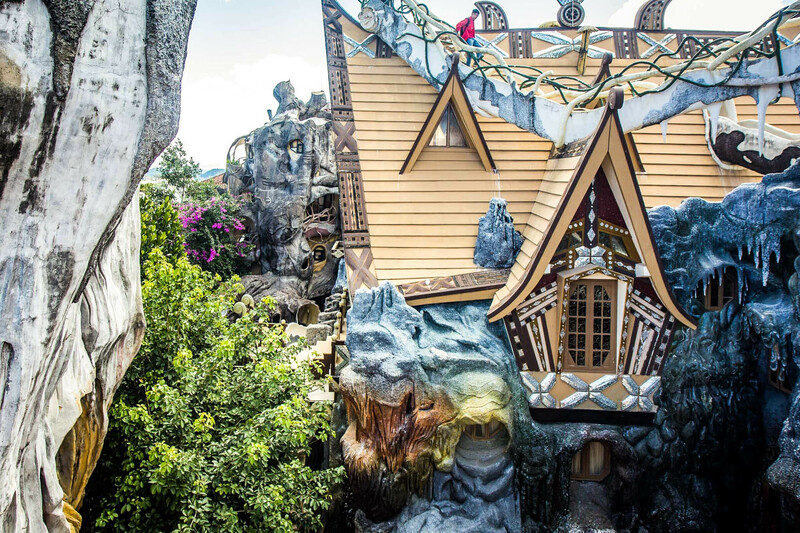 This bizarre, higgledy-piggledy architectural wonder was built by Mrs. Dang Viet Nga—a Vietnamese woman with a PhD in architecture. Since its initial opening in the 1990s The Crazy House has been an ongoing art project in constant evolution. You can choose to simply pass through and enjoy the abstract designs or go ahead and book a room for the night at their onsite Hang Nga Guesthouse. Whatever you chose, get ready to put your head on a swivel as you wind through the spiderweb of paths leading to multi-themed rooms each offering up their own amusements. If you travel to Dalat, this is one experience that you can’t pass up.